The Berlin U- Bahn is a rapid transit system that serves Berlin, Germany. The system began operations in the year 1902 and presently has 10 lines that serve 170 stations. The system has a total track length of 151.7 km (94.3 miles). The system is owned and operated by Berliner Verkehrsbetriebe (BVG). As per 2012 statistics, the system had an average daily ridership of 1,390,000 passengers and an annual ridership of 507.3 million passengers. It is integrated with the Berlin S-Bahn and is an integral part of public transportation system in berlin. Map of Berlin U-Bahn showing various lines and stations. Click on the Map to Enlarge it. You can also Download Berlin U-Bahn Metro Map PDF. The metro operates from 4:00 am till 1:00 am on weekdays. The frequency between trains is 5 minutes during day and 10 minutes during night time. The U-Bahn runs full days on weekends and public holidays. The frequency is 10 minutes during day and 15 minutes during night. 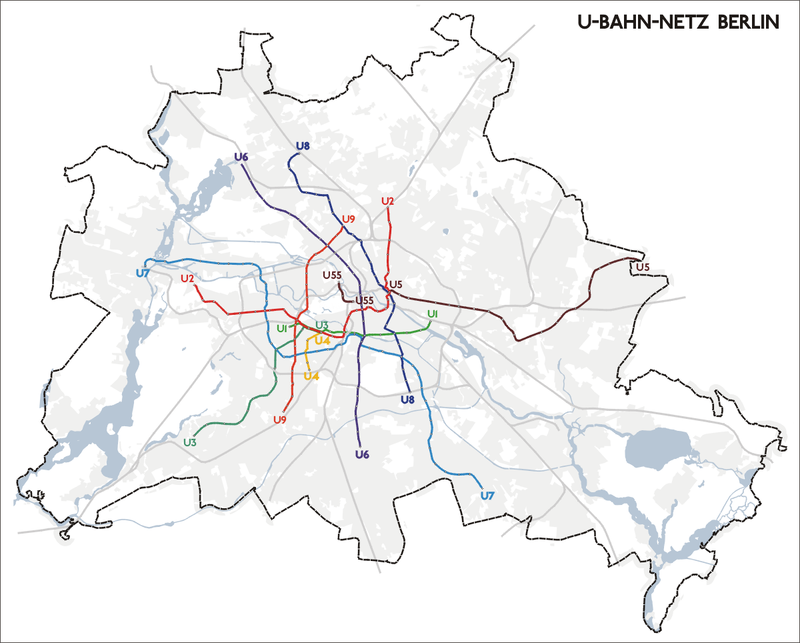 The fare system on the Berlin U- Bahn is zone based and is divided into three zones A, B and C. Zone A consists of the inner city and includes the urban rail ring. Zone B is outside of the urban rail ring and extends up to the city boundary and Zone C is Greater Berlin and also includes the city of Potsdam. Passengers who use the public transport occasionally can purchase single ticket. The ticket is valid for two hours and allows unlimited transfers between trains and buses or journey interruptions within these two hours. Return journey is not permitted on this ticket. Single ticket for Berlin Zone AB costs 2.70€, for Berlin zone BC, costs 3€ and for Berlin zone ABC costs 3.30€. For children in the age group 6-14 years reduced fares apply. For zone Berlin AB, the reduced fare is 1.70€, for zone Berlin BC, the reduced fare is 2.10€ and for zone Berlin ABC, the reduced fare is 2.40€. Riders can avail discounts in the zone Berlin AB by purchasing the 4-Trip Ticket. This ticket cannot be used on buses and trams. The adult fare is 8.80€ and the child fare is 5.60€. A Day Pass provides unlimited travel for the day printed on the ticket or from the time the ticket has been validated till 3.00 am the next morning. The adult and reduced fare for zone Berlin AB is 6.90€ and 4.70€, for zone Berlin BC is 7.00€ and 5.10€ and for zone Berlin ABC is 7.20€ and 5.30€ respectively. A 7-Day or weekly ticket provides unlimited travel for seven consecutive days. The ticket is valid from the time of validation till midnight of the seventh day. The ticket for zone Berlin AB, Berlin BC and Berlin ABC, costs 28.80€, 29.70€ and 35.60€ respectively. Frequent travelers can purchase monthly tickets. The ticket for zone Berlin AB, Berlin BC and Berlin ABC costs 78.00€, 79.50€ and 97.00€ respectively. Riders can also pay for a year in advance by buying Annual tickets. These tickets provide a discount of 23% as compared to the price of 12 monthly tickets. The ticket costs 722.00€ for Berlin AB, 763.00€ for Berlin BC, and 924.00€ for Berlin ABC. Group tickets can also be purchased for a group of five people and costs 16.20€ for Berlin AB, 16.50€ for Berlin BC and 16.70€ for Berlin ABC. Group tickets can also be purchased for school children for school trips, and is valid for children up to eight years of age. It costs 3.10€ for Berlin AB and 3.20€ for Berlin ABC. Children under the age of 6 years can travel free. Tickets can be purchased from vending machines or from ticket counters. There are plenty of park and ride options available next to the S-Bahn and U-Bahn stations and outside the environmental zone. Multi storey car parking facilities are also available at cheap rates. There are open car parks available with minimal security. Single tickets should be validated immediately after starting the journey. These tickets cannot be transferred after a journey has started. Transit of small pets like dogs, is allowed on the metro. When the person accompanying the dog has a single ticket, a reduced fare ticket needs to be purchased for the dog. For rest of the tickets, one dog can travel free of charge while a reduced fare ticket is required for additional dog. Bicycles can also be carried on the metro by purchasing a bicycle ticket. Berlin U-Bahn consist of 10 lines. All the lines are divided into two types. Small profile lines are U1, U2, U3 and U4. Large profile lines are U5, U55, U6, U7, U8, U9. Berlin U-Bahn lines are recognized with a letter and color. U1 – Line U1 started its operation between 1902 and 1926. The length of this route is 8.814km. Line U1 serves 13 stations and the metro train runs between Uhlandstrabe and Warschauer Strabe. U1 is Berlins oldest metro line. U2 – Line U2 started operation in 1902 and the length of this route is 20.716km. U2 line serves between Pankow and Ruhleben. U2 line serves 29 stations. U3 – Line U3 was opened in 1913 and the length of this route is 11.940km. U3 line serves between Nollendorfplatz and Krumme Lanke. U3 line serves 15 stations and in 2004, the line was re-introduced. U4- Line U4 was opened in 1910 and the length of the route is 2.8 km. U4 line serves between Nollendorfplatz and Innsbrucker Platz. U4 line serves 5 stations and it is connected to the Berlin small profile system. U5- Line U5 was opened in 1930 and the length of the route is 18.3km. U5 line serves between Alexanderplatz and Honow. U5 line serves 20 stations with a short underground section of 9km. U55- Line U55 was opened in 2009 and the length of the route is 1.4 km. The line serves between Hauptbahnhof and Brandenburger Tor. U55 line serves 3 stations and it operates as an isolated line. U6 – Line U6 was opened in 1923 and the line serves 29 stations. U6 line is served between ALT-Tegel and ALT-Mariendorf. U6 line serves 29 stations. U7 – Line U7 was opened in 1924 and it operates between Rathaus Spandau and Rudow. The length of the route is 31.7 and it serves 40 stations. U8 – line U8 was opened in 1927 and it operates between Wittenau and Hermannstrabe. The length of the route is 18.04km serving 24 stations. U9 – Line U9 was opened in 1961 and it operates between Rathaus Steglitz and Osloer Strabe. The length of the route is 12.5km serving 18 stations.